Investors argue about politics, but they should be able to agree on the upcoming US presidential election. None of the leading candidates show much economic common sense. Start with the credit crisis. 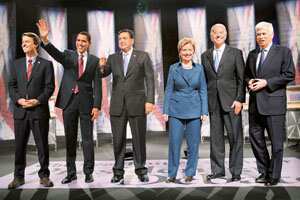 Common sense: Democratic presidential hopefuls (L to R) former senator John Edwards, senator Barack Obama, New Mexico governor Bill Richardson, senator Hillary Clinton, senator Joe Biden, and senator Chris Dodd greet the audience before the Des Moines Register Presidential Debate on 12 December in Johnston, Iowa. In so far as the Democrats have any policy suggestions, they all involve helping more underwater buyers float to the surface—ultimately at the government’s expense. But no Republican candidate has shown any firmness either. It looks like the currently proposed “teaser-freezer", a plan to keep interest payments at what were supposed to be introductory rates, is just a first step. Even if the US government avoids additional mortgage subsidies, an economic slowdown would cause the fiscal deficit to balloon. The candidates’ response is basically, “What, me worry?" The Democrats are busy making unrealistically low estimates of the cost of extending health insurance, while the Republicans are anxious to keep the Bush tax cuts in place. Another non-worry for the candidates is inflation. No candidate ever speaks on the topic. The mantra seems to be growth at any cost, including a bit more inflation. With the Federal Reserve Board on much the same wavelength, investors should be wary. Then there is the trade deficit. In another era, politicians would be jumping up and down at the thought of the world’s industrial superpower importing 45% more than it exports. But there is no political talk of industrial regeneration or of ways to encourage savings and investment. Instead, low interest rates are praised and candidates vie to frighten the trading partners—and creditors—of the world’s super-debtor. As long as the US doesn’t appear to be serious about reducing the trade deficit, the dollar remains vulnerable. Bill Clinton won two polls by remembering that for voters, “It’s the economy, stupid". The 2008 candidates are taking that advice to heart—by saying stupid things about the economy. If the next president stays true to his or her word, then investors should bet on higher government deficits, higher inflation and a weaker dollar.